There’s good news on the horizon for members of the Google Glass Explorers initiative. 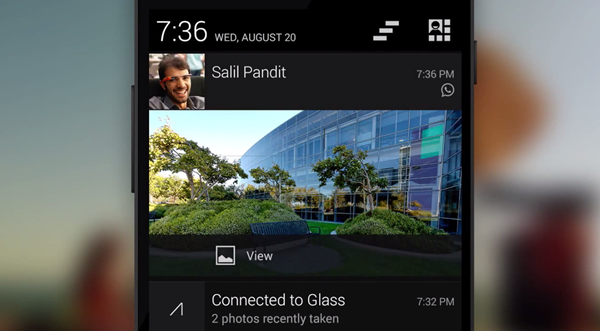 As part of the continued development of the internal software that powers Google’s intelligent eyewear, the company has introduced a new feature that will allow users to view all phone notifications via Glass. As things stand at the moment, Glass owners are only able to view and interact with notifications that are presented as part of Glass compatible apps. This will be extended to fall in line with the notification-forwarding system that allows Android Wear wearables to receive every notification as it’s received on the connected device. It may not seem like a particularly huge step forward for humanity, but it’s certainly one giant leap for Google on behalf of those loyal Explorers who interact with the Glass headwear on a daily basis. The new and improved notification abilities, which will be rolled out periodically from today as part of a MyGlass software update, means that users will no longer need to extract the connected smartphone from their pockets each and every time a new notification is received from an installed app. Notifications ranging from social media invites, emails, incoming texts, news alerts and even battery updates will be delivered directly to the screen of the Glass headset. Today we’re launching Notification Sync on Glass, which means you can see your Android phone app notifications at a glance. You may have already seen this with Android Wear, but now when you put Glass on, you can get the information you need when you need it-all without taking your phone out of your pocket. MyGlass version 3.3.0 should start to roll-out during the course of the day. If you’re not in the ownership of Glass, then you can grab yourself one directly from the Play Store. jailbroken iphone been syncing notifications to google glass since a year now… but you could only view the notifications not interact with them such as reply to messages.. Lets hope they add that part.